Cinco de Mayo… the day everyone celebrates their Mexican heritage – or just their love of everything Mexican. (Hello, tequila!) Blended Kitchen loves Mexican-esque food. 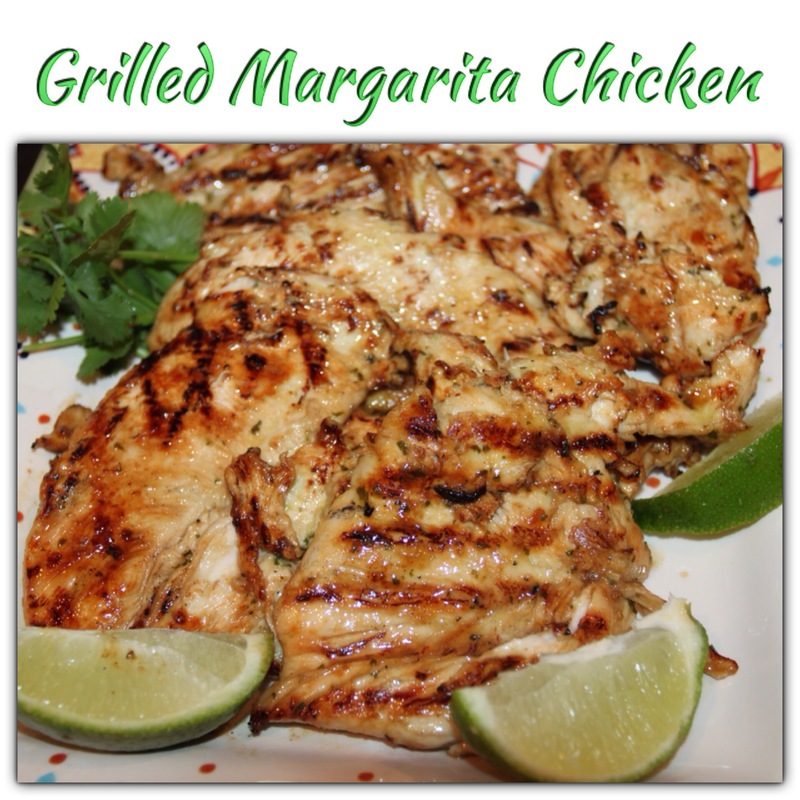 It’s evident in our past posts – chicken tortilla soup, chicken chilaquiles, oven baked churros, south of the border chicken, beer margaritas, margarita cupcakes – and now, grilled margarita chicken! Break out the maracas and tequila! Arriba! In the Blended Kitchen, we’re always in the mood for Mexican-style foods and this margarita chicken had all the flavors we love in Mexican food – tequila, lime and cilantro. The chicken is perfect as a main course with some southwest rice and beans, but would also be great on a summer salad with tons of avocados. One thing’s for sure: this chicken will be on our menu all summer long. Measure 2/3 cup cilantro and add to blender to food procesor. Mix the remaining ingredients through honey and pulse until blended. Start with 3/4 cup cilantro. Place the cilantro and listed ingredients in a blender or food processor. Pulse until thoroughly blended. 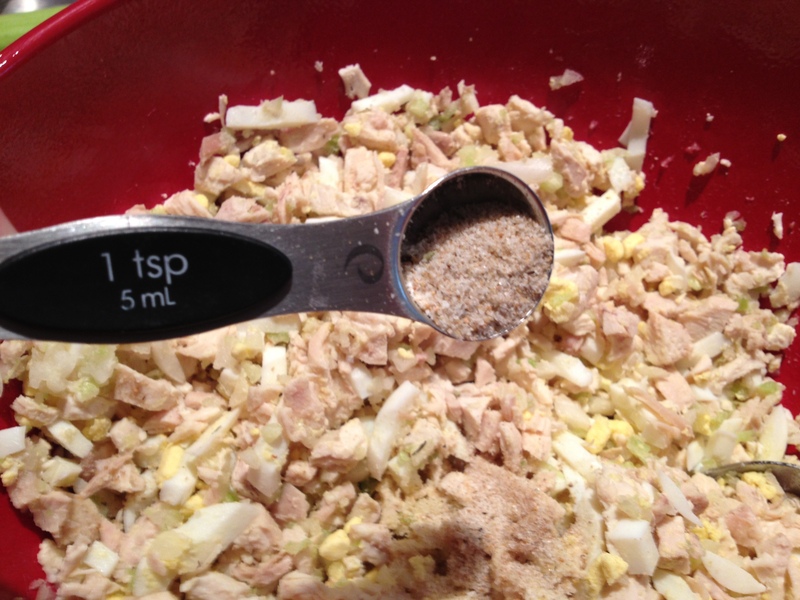 The blended marinade after adding oil. Pour over the chicken and marinate in a Ziploc baggie for 5-6 hours. Gradually add the oil and blend well. Pour over the chicken and marinate in a Ziploc baggie for 5-6 hours. Preheat an outdoor grill to medium-high heat and lightly oil the grate. 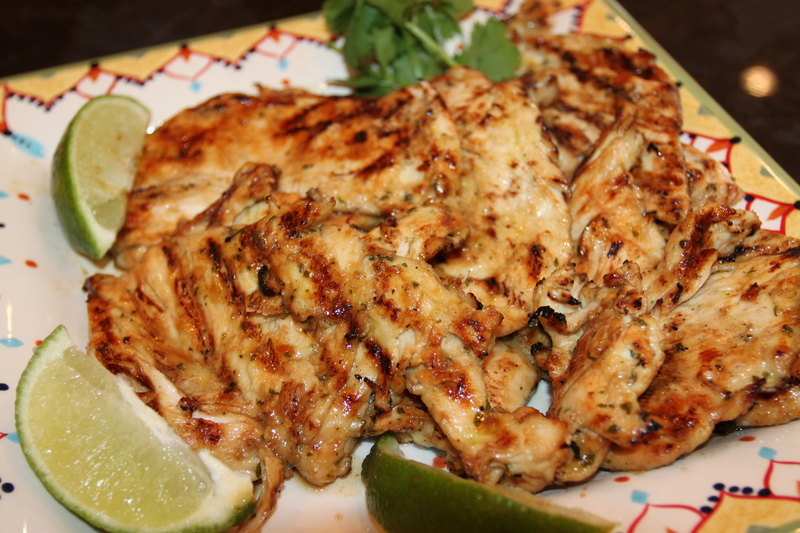 Remove chicken from the marinade, shake off excess and discard remaining marinade. Grill the chicken until tender and juices run clear, approximately 7 minutes per side. Or, if you use flattened chicken breasts like we did, just a few minutes per side should do. Place cilantro, pepper, garlic powder, onion powder and seasoned salt in the bowl of a blender or food processor. Pour in limeade, lime juice, orange juice, tequila and honey. 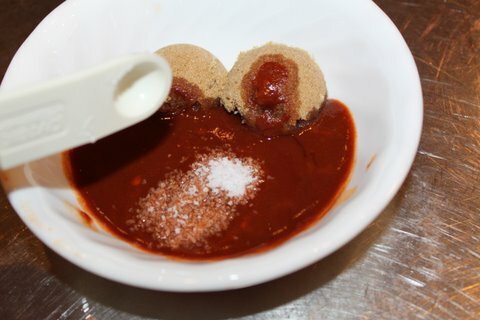 Puree or blend on high speed until smooth, then reduce speed to medium-low, and slowly add the olive oil; blend until creamy. Place chicken breasts in a resealable plastic bag. Pour marinade over the chicken and toss to coat. Refrigerate for 5 hours. Remove chicken from the marinade shake off excess, and discard remaining marinade. Grill the chicken until tender and juices run clear, approximately 7 minutes per side. The idea to blog about these was kind of an afterthought, so we apologize for the lack of instructional photos. It’s super easy to assemble so you really won’t need the directions in picture form anyway. We made these for a baby shower and as Cindy was finished making these and arranging them on a platter, she screamed “don’t eat any until I take pictures for the blog!” Let’s be real. How could we not blog these adorable apps? These would be perfect for any party or even a barbecue in place of (or in addition to) a salad. The skewers are easy to eat while visiting with friends. And who doesn’t love easy party food? It’s a great “make-ahead” dish and it travels well. It just keeps getting better! 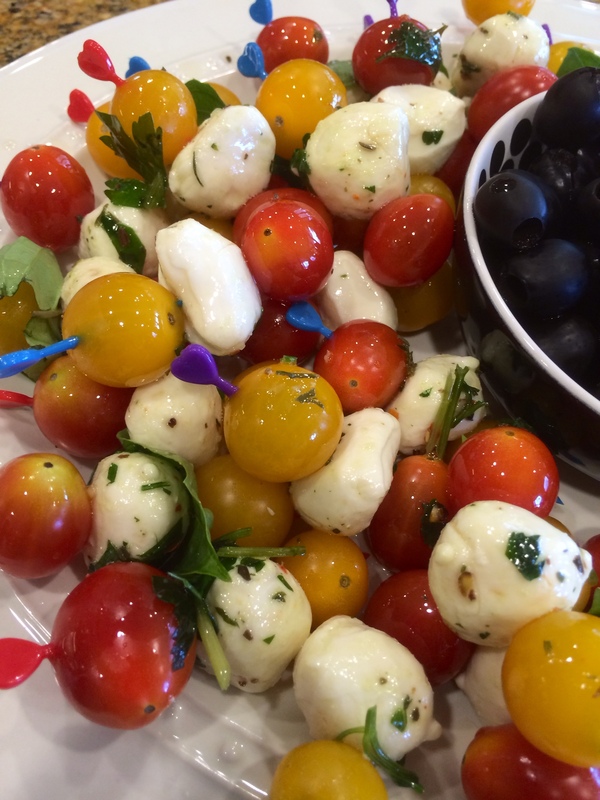 Grape tomatoes – we mixed it up with 2 colors on each skewer. Mozzarella – we used the “pearl” size. It’s the perfect size for skewering. We also used the marinated for a little added flavor. Basil – After opening our package of basil, we found it was rotten (wahhh!!!). Thankfully we had the marinated mozzarella that had the seasoning and basil in it so we improvised and drizzled that marinade on it trying to make sure each skewer had some basil. Toothpicks – try to find some that are longer than the usual toothpicks. A party store or kitchen store would be a great place to look. You can also make these larger with kebab skewers. 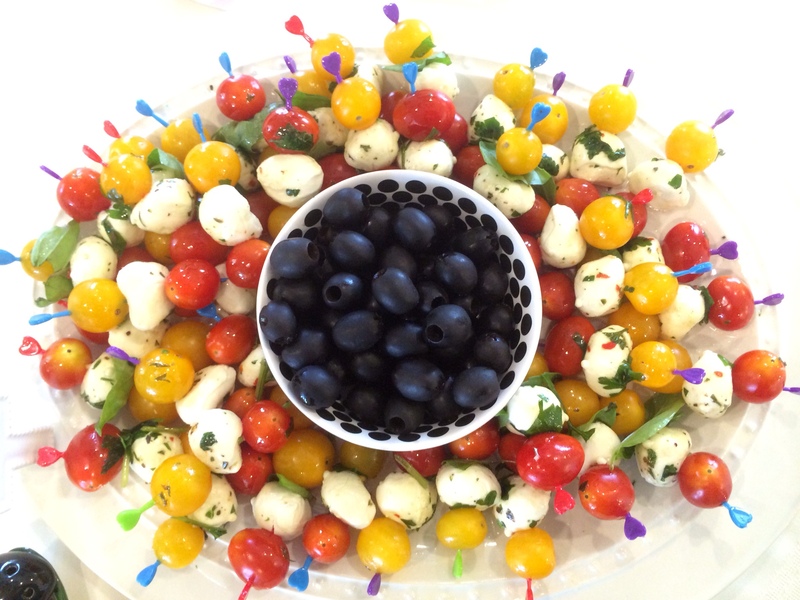 Skewer a tomato, mozzarella ball, piece of basil and another tomato on each toothpick. If you don’t have basil, don’t fret, use the marinade like we did to add the basil and add color. We also drizzled a little of the marinade over the final product to get some of those delicious flavors in there. If you choose not to use the marinated mozzarella, a drizzle of balsamic would be delicious on these. 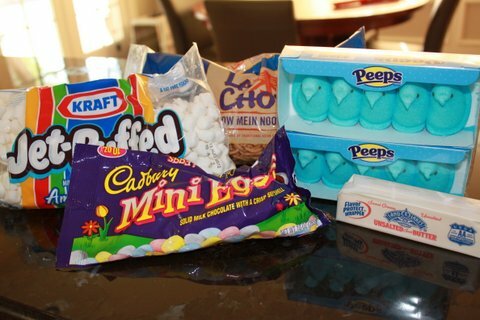 If you’re looking for a fun Easter treat, stop right now because this is it! 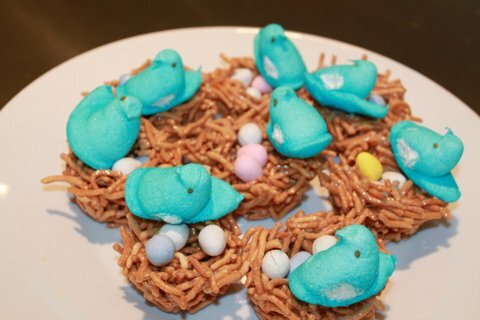 These adorable nests are the perfect dessert for your Easter buffet. Did we mention they’re kid friendly? 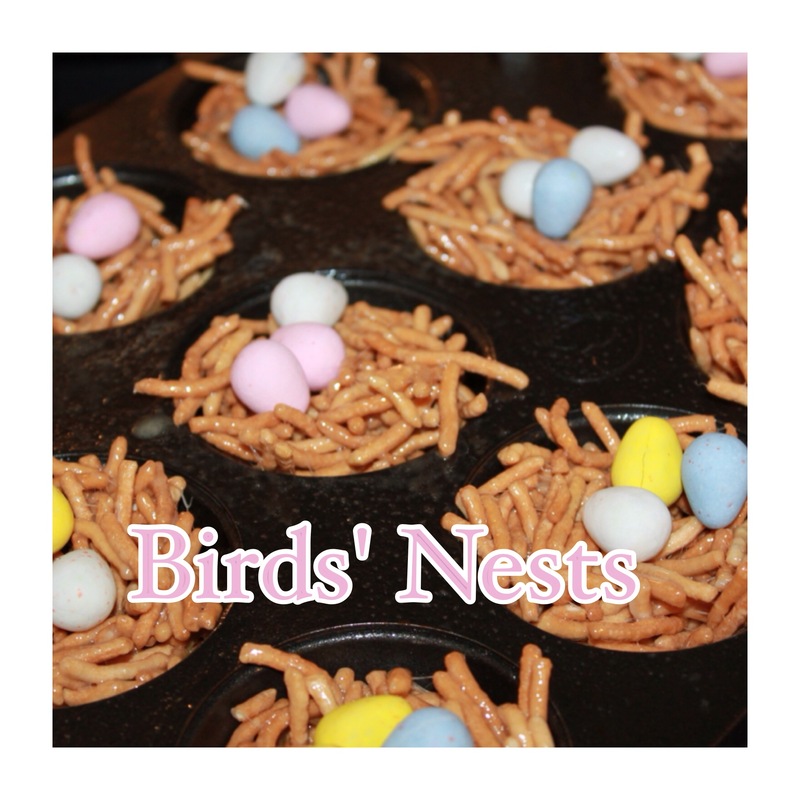 Kids absolutely love helping you make these nests, so get the whole family involved! These little nests are ridiculously easy to make and taste pretty darn good, too. 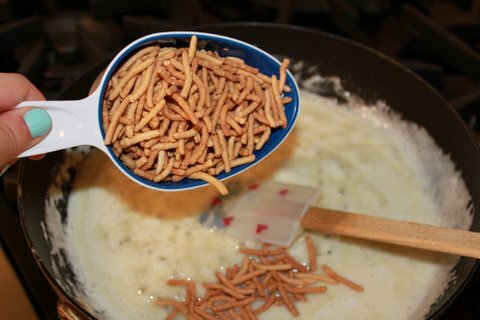 The chow mein noodles are crunchy and a little bit salty, which provides the perfect contrast to the gooey marshmallows that serve as the glue for the nests. The Cadbury Mini-Eggs on top are Lindsey’s favorite part – they remind her of studying abroad in Scotland. If you’re anything like her, you should probably buy an extra bag of the mini-eggs so that you have enough left over after munching to top these adorable nests. It really doesn’t get easier (or yummier) than this. 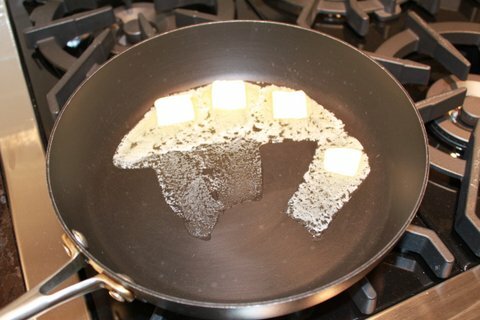 Add marshmallows to the butter. 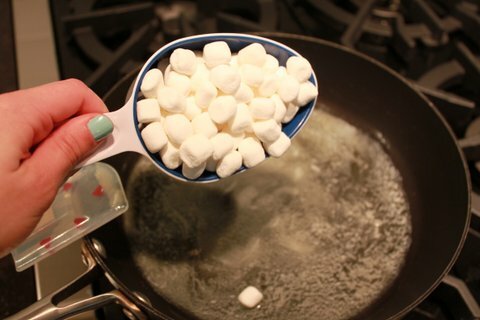 Stir the marshmallows and butter until melted and smooth, like the photo above. Add the noodles to the marshmallow mixture. Mix the noodles and marshmallows together until the marshmallows hold the noodles together like a glue. This is very similar to making Rice Krispies treats. 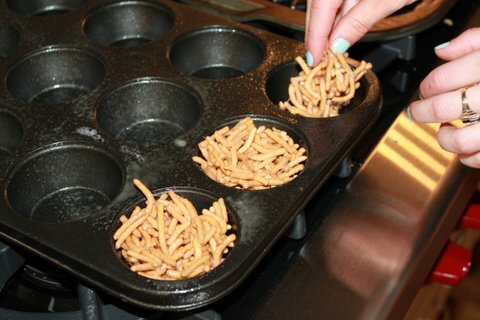 Let the mixture cool slightly and scoop into the muffin tin, shaping the noodles into mini nests. Place several candy eggs in each nest. 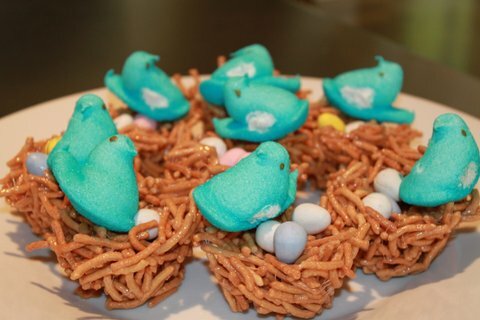 Garnish each nest with a Peep as a “momma bird,” and get ready to have friends and family ooh and ahh over these cute desserts. Heat butter and marshmallows over medium heat, stirring until melted. 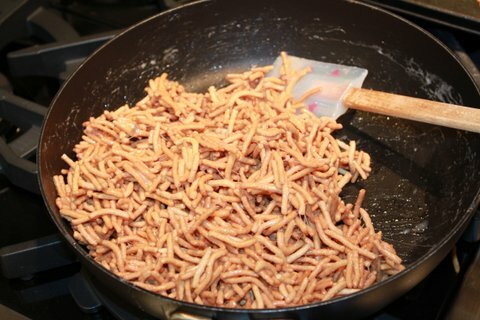 Add noodles to the marshmallow mixture and stir till completely coated, like you would do when making Rice Krispies treats. Spray a 12-cup muffin tin, then hands with cooking spray. 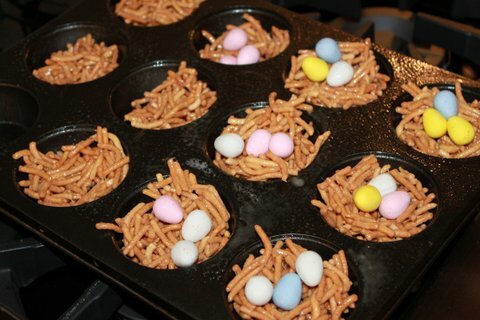 Place mixture into muffin cups and shape with hands to form “nests.” Fill nests with candy eggs and perch one Peep on the side of each nest. Place nests on a tray and put back in the fridge till completely set. 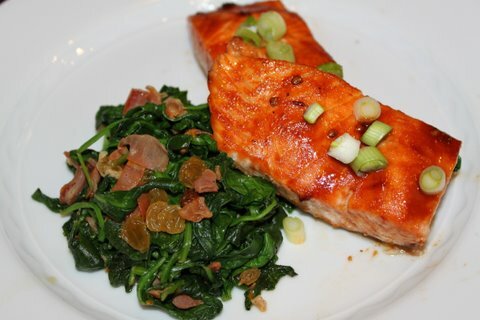 With the last week of Lent approaching, we wanted to repost one of our favorite salmon recipes that got great reviews. This is a sweet and spicy dish – which we are all about! Also, it’s a Weight Watchers recipe which helps us get prepared for all the chocolate the Easter Bunny will leave for us. This fish is one of our favorites not just during Lent, but year-round. It’s easy to whip together on a busy Friday night and the sweet/smoky combination is unbeatable. 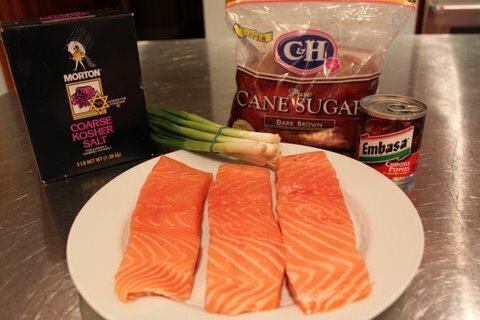 It all starts with these beautiful fresh filets of salmon. 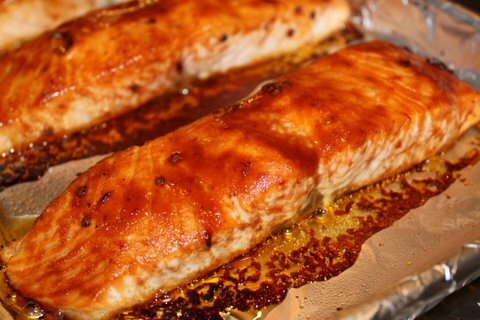 The brown sugar and the adobo sauce (which is what chipotle peppers are canned in) make the perfect sweet and spicy glaze for the fish. Top it all off with some fresh green onions and you’ll be nomming like crazy. 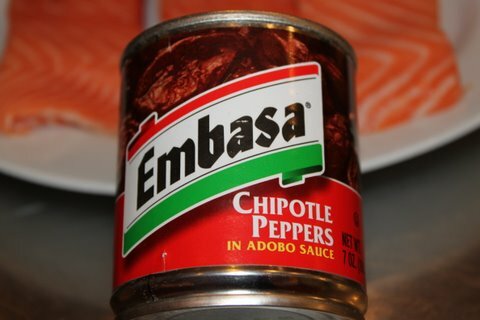 In order to get adobo sauce, you have to buy chipotle peppers that have been canned in the adobo sauce. 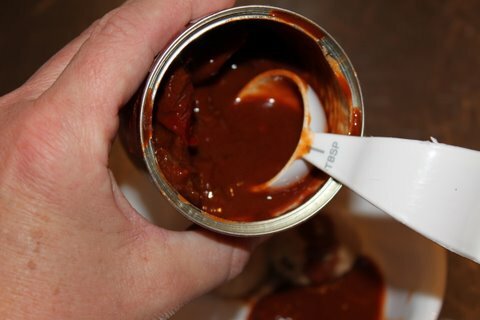 Don’t search high and low for adobo sauce like we did – just buy a can of chipotle peppers like this and you’ll be good to go. 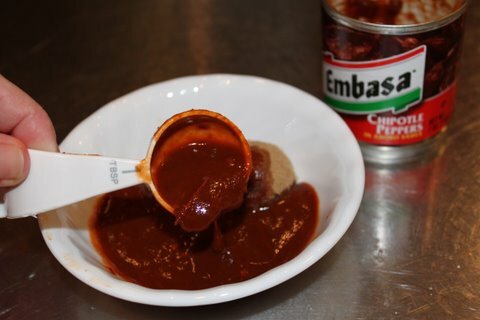 To make the glaze, first measure out the adobo sauce. Add the adobo sauce to the brown sugar. To the brown sugar and adobo mixture, add the kosher salt. Brush the glaze on the salmon filets, coating the top of each filet nicely. Once you’ve done this, stick the salmon filets in the oven at 450° for 13 minutes, or until the desired degree of doneness. The filets will come out of the oven when they’re shiny and golden brown on top. 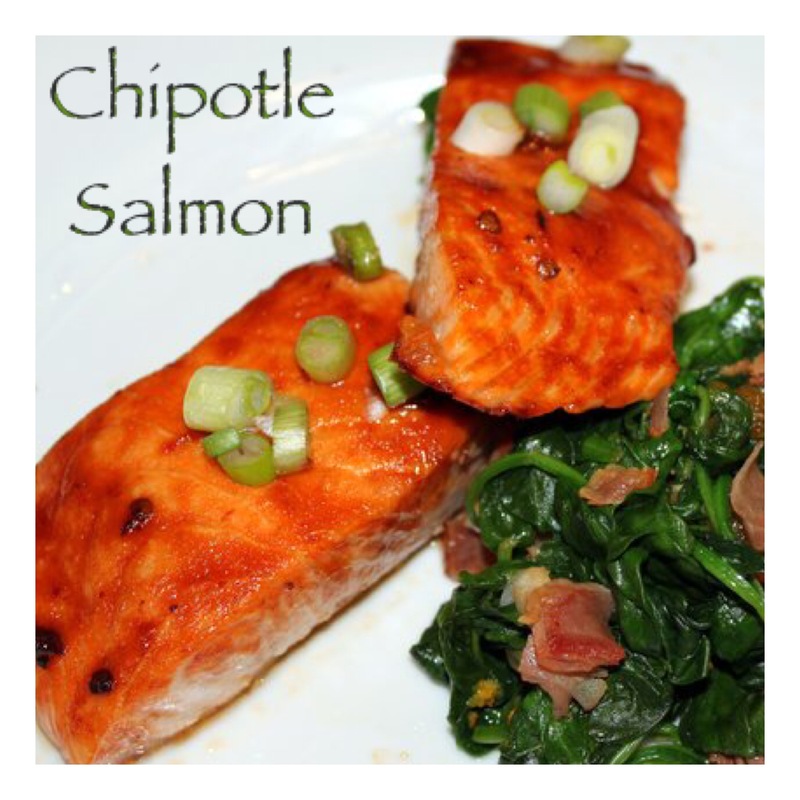 Top the salmon with chopped green onions and plate it with a big side of spinach. Then dig in! Combine first three ingredients in a small bowl. 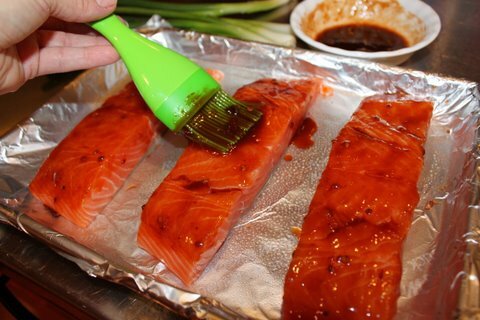 Line a baking sheet with foil; coat foil with cooking spray. Place fish, skin sides down, on foil; brush fish with adobo mixture. 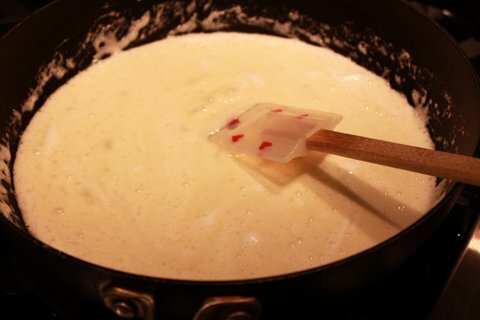 Bake at 450° for 13 minutes or until fish flakes easily when tested with a fork or until desired degree of doneness. Sprinkle with onions before serving. At Blended Kitchen, we like to take some of our favorite things and put a new spin on them. Whether it’s serving crab rangoon in mini-bites, making risotto in the oven or fancying-up chicken salad with some lemon pepper and chicken broth, we’re always adding a little extra kick! 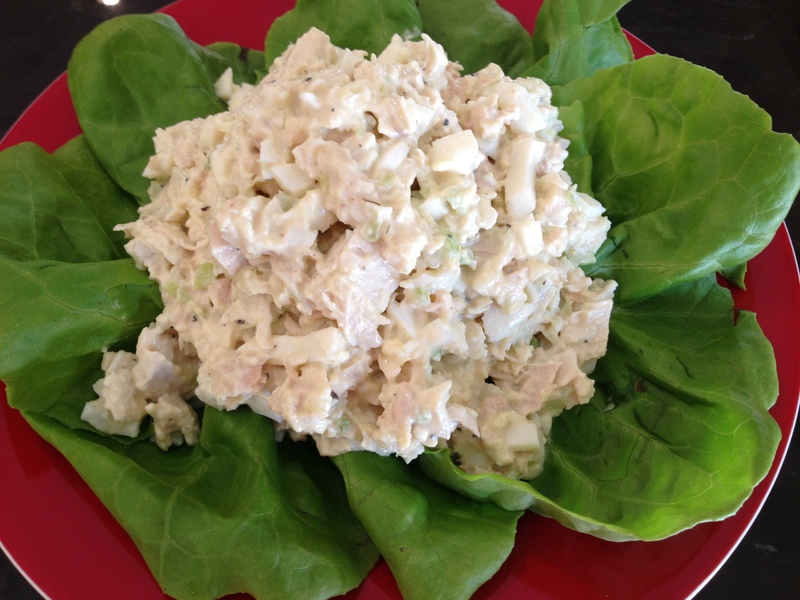 This chicken salad recipe is no different – it really takes your mom’s chicken salad and kicks it up a notch. 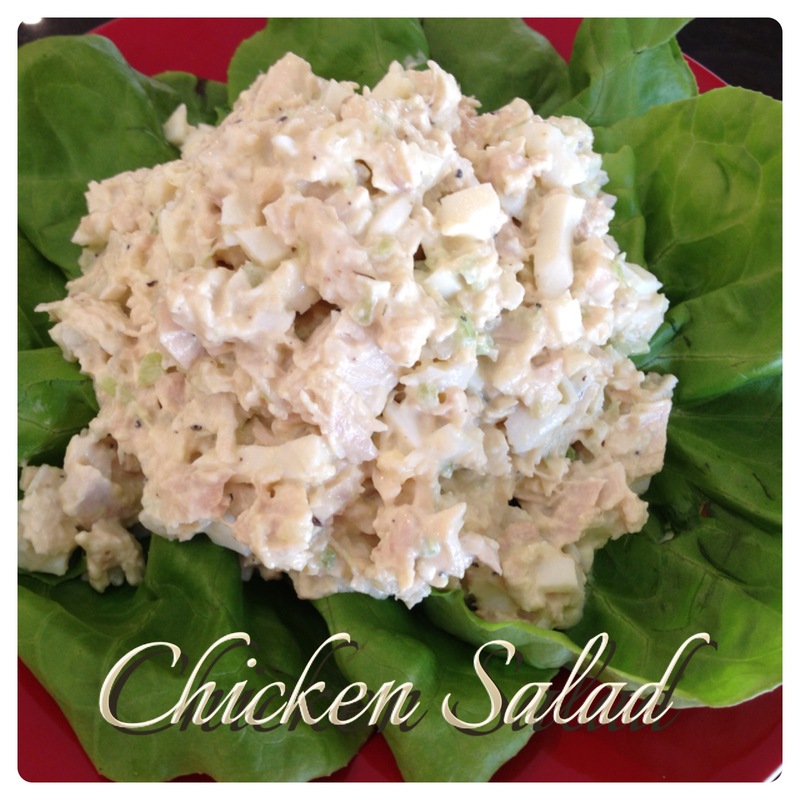 If you like chicken salad, you must try this. We think the addition of chicken broth and a little lemon pepper to the mixture is what makes it so different from others we’ve tried. We love having a big bowl of this handy on weekends that are busy. We all love it – including Nugget! If you are doing a low carb lifestyle, this is perfect on lettuce. It’s also delicious with crackers, on toast or just a spoon! 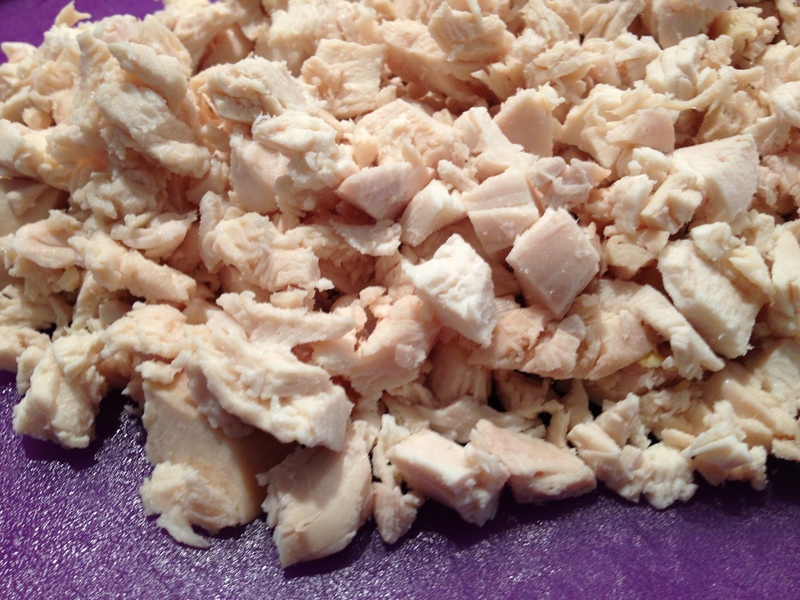 Start with some cooked chicken breast chopped into small pieces. 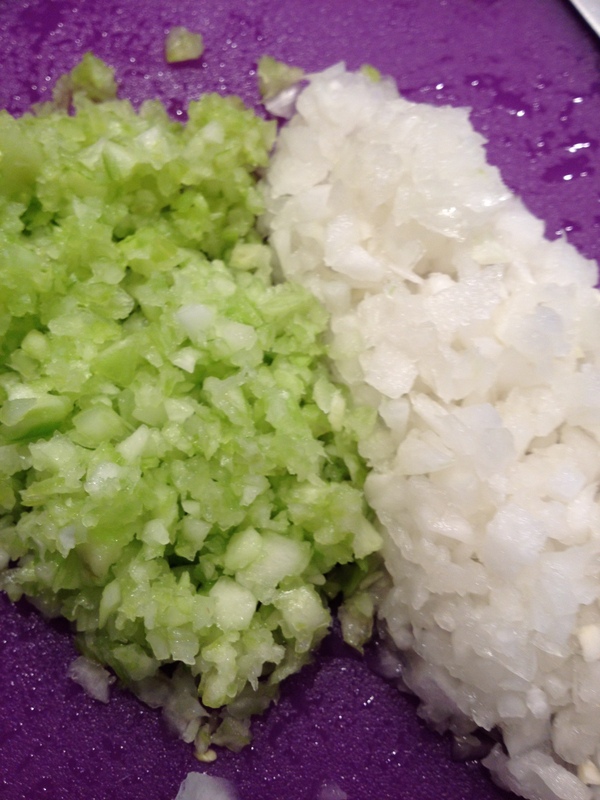 Chop the onion and celery super-small. We use a food chopper to get it just right. 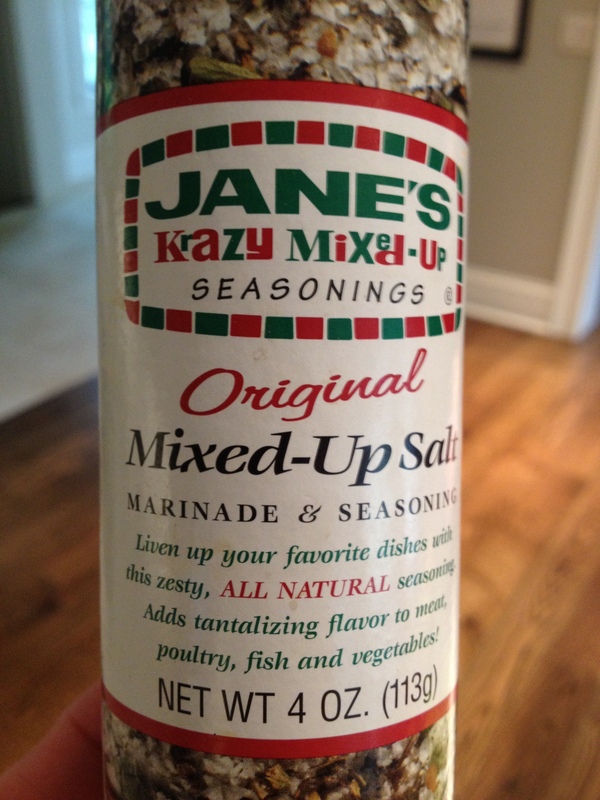 This can be found in the spice aisle – it’s a great way to add a little different flavor. We forgot to photograph the addition of hard boiled eggs. So don’t forget the eggs… we are guilty of adding more than it’s called for. We love hard boiled eggs! After you mix in the egg, add the dry seasonings. Mix well and get all those flavors to marry. This is so good you may want to marry it. Yes, we are 12 years old. Hello beautiful… will you marry me? We’re only kind of kidding. This chicken salad really is that good! Dice the chicken and place in a large bowl. 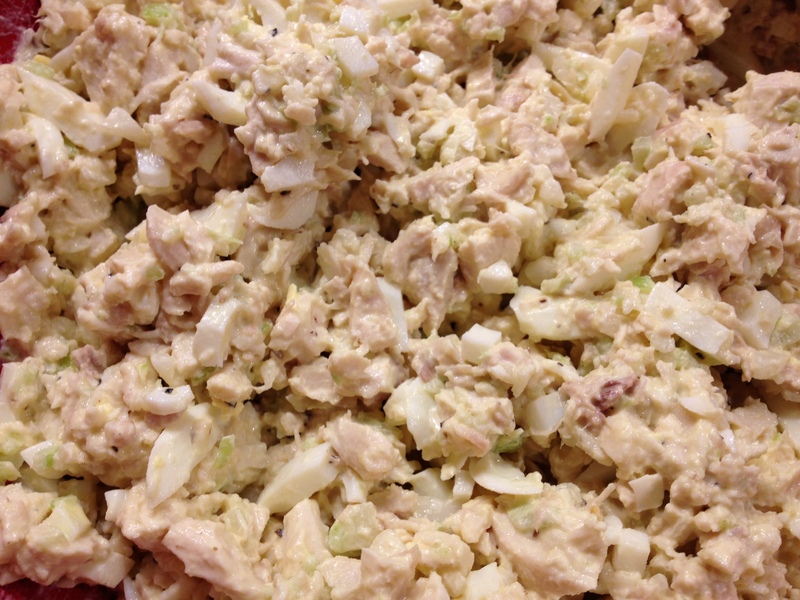 Add the chopped celery, onion, eggs, seasoning salt, mayonnaise, lemon-pepper, pepper, and some chicken stock and mix well. Serve with crackers, on a sandwich or on a bed with lettuce.